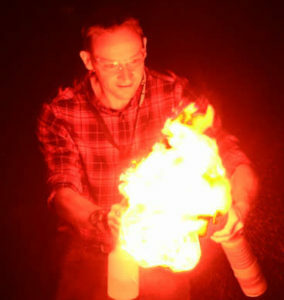 Matthew Tosh is a hugely popular firework science presenter, appearing at schools, colleges and festivals across the UK. He is a qualified science teacher, experienced presenter and a professional pyrotechnician, so you always get the real deal with Matthew! You’ll find out what it is really like to work in this unusual industry. As a former science teacher, you can be sure that Matthew will provide an experience that is engaging, exciting and expertly pitched for your audience. 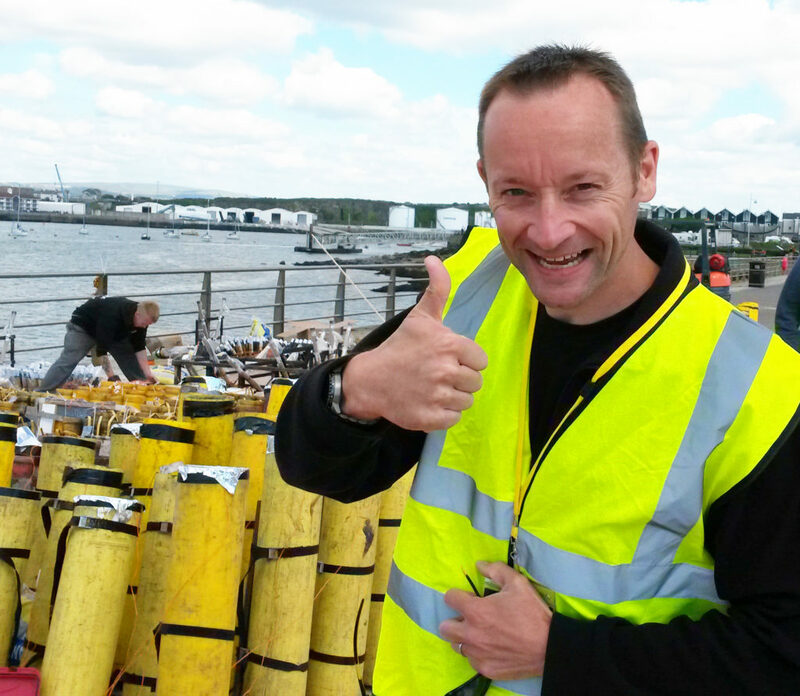 What’s more, his work has won international support from the global fireworks industry. The costs of each show varies according to distance, so please contact Matthew for a quotation. It’s worth checking out the frequently asked questions (FAQs) too as there is useful information there about logistics, health and safety. Explore the colourful and explosive world of pyrotechnics as Matthew deconstructs the STEM behind firework displays. He’ll demonstrate how to create colours, different sound effects, shock waves and perfectly timed bursts in time to music, whilst ensuring that displays are safe. Matthew customises the show to fit your school hall or theatre, assuring attention to safety throughout. 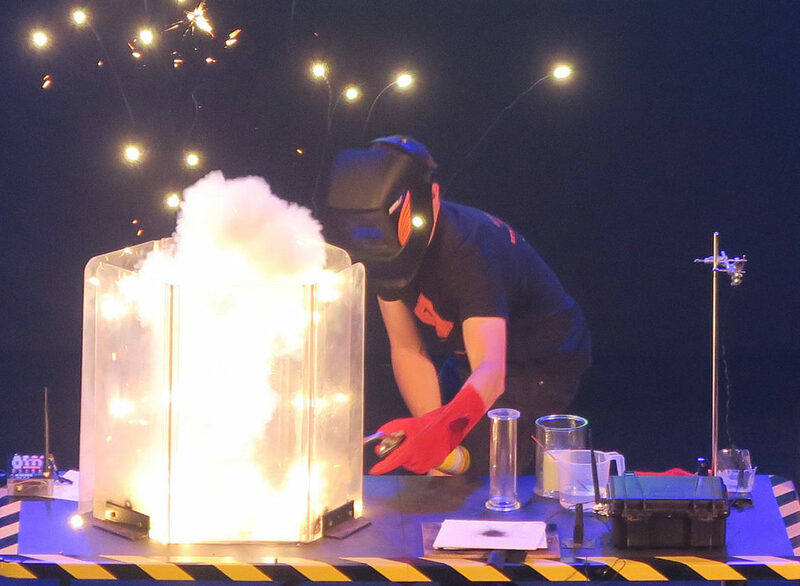 Featuring shock waves, forces, energy pathways, electricity, flames, sparks, smoke effects and real indoor fireworks, this is an exciting and dramatic show that will guarantee to have the audience on the edge of their seats. 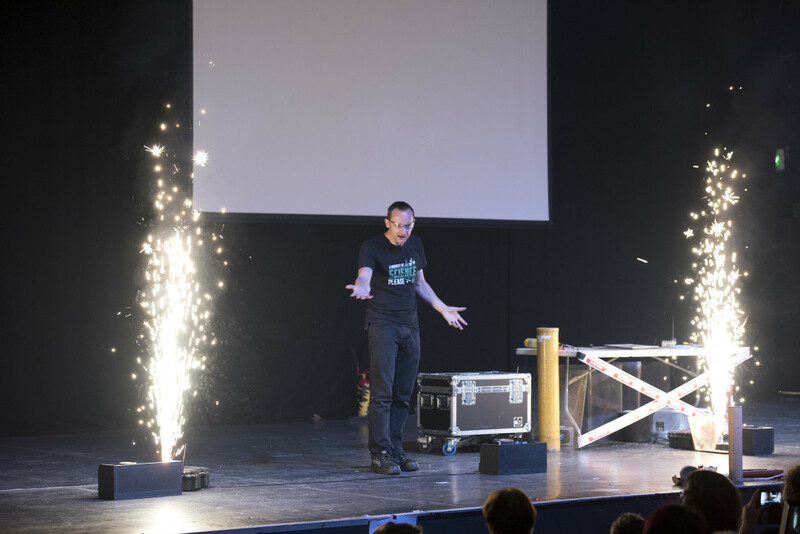 This lively show demonstrates how many fundamental aspects of science are used to create the building blocks of modern-day firework displays. Matthew takes time to talk about the skills required, the working conditions (pretty grotty at times!) and how the STEM subjects play an important role in what he and his crews do. Popular with organisers of activity days, fundraising events, high profile events or just an excuse for something a bit different at your school, Matthew will deliver something truly unique. Think of a large-scale outdoor science lesson, where you actually feel the ground shake and you’re pretty much there. 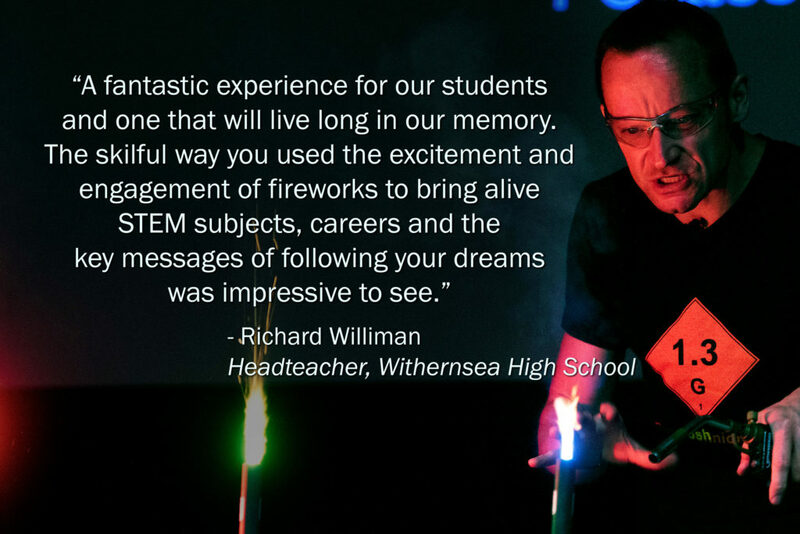 Matthew and his team will demonstrate black powder, rates of reaction, forces, supersonic waves, energy transfers, moments, colours, aerial effects and larger fireworks, all backed up with sound science explanations. And yes, this can take place during daylight hours! Depending on the size of the audience, you will need a PA system. This can be arranged on your behalf, although most schools provide their own. You also have the option of adding a professional display to finish off your event (additional fees apply).